With a lot of pumpkin kisses and harvest wishes, we were able to create these absolutely charming pumpkin felt balls! Featuring three different Little Felt Pumpkin sets, you’ll find handmade felt pumpkins in white, black, granite, harvest gold, yellow-orange, lemon chiffon and light yellow-orange. Simply choose the colors that best suit your craft aesthetic for DIY felt pumpkin decorations perfect for fall and the Thanksgiving season. For wet felted pumpkin garlands, simply string these pumpkins together with a needle and twine—they pierce quite easily! Our little pumpkins measure approximately 1.5 inches. Looking for something even smaller? 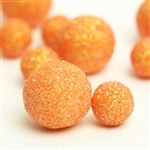 Our mini pumpkins, available in a mini set, only measure 1.25 inches! You can create necklaces or drop earrings, or fill a container up with pumpkins for quick and easy mini-pumpkin felt décor. If you want to have the cutest pumpkins in the patch, you’ve just found them!